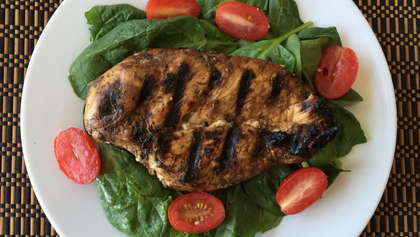 An easy chicken marinade that will leave your taste buds satisfied. You won't have to eat bland chicken ever again. Slightly pound chicken breasts until even thickness. Place chicken in a large zip lock bag. Mix marinade ingredients and pour over chicken. Refrigerate for 1 to 24 hours. When ready to cook, discard marinade. Oil or spray grill. Heat to medium high heat. Cook chicken on direct heat for 5 to 6 minutes. Turn once. Cook for another 5 to 6 minutes or until chicken is no longer pink and juices run clear. May be drizzled with additional balsamic vinegar before serving.